Chelsea Costa studies Environmental Engineering and Environmental and Sustainability Studies with experience using GIS software. She works at the WPI Gordon Library and at the Office of Sponsored Programs as an office assistant. Paula Miller studies Biology and Biotechnology. She works at the WPI Gordon Library as a student supervisor and at New England Biolabs during the summer. Dante Pace studies Electrical Engineering and is trained in operating film projectors. He worked for a small robotics integration company for a short time, using shop tools to construct various custom cables, switches, and large machinery encasing. Victoria Scott studies Biology and Biotechnology. She works at the WPI Office of Financial Aid and is highly involved on campus. The Blackstone Canal District Alliance started as a city task force focused on reviving the Blackstone Canal and the Canal District. After the completion of a feasibility study in 2003, members of the original task force branched off to form the Blackstone Canal District Alliance. The Alliance is a non-profit organization whose goals are to educate the general public about the history of the Blackstone Canal, to promote the replication or restoration of the Blackstone Canal, and to revitalize the Blackstone Canal District. John Giangregorio is the President of the Alliance. The Blackstone Canal District is located in the southwest corner of District 2, represented by Councilor George Russell. 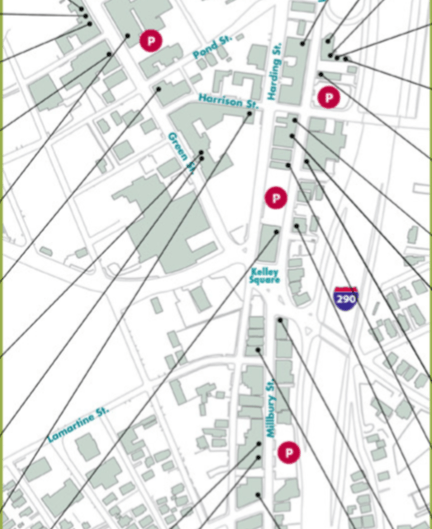 This map, taken from the Blackstone Canal District Walking Map, is a small section of the center of the district. The entire district spans from Washington Square to south of Brosnihan Square. The task presented to our team was to analyze and determine the feasibility of ameliorating the Combined Sewer Overflow affecting the section of the Blackstone Canal running between Union Station and Kelley Square. Our first goal was to evaluate the current condition of the Blackstone Canal. We gathered maps, researched city documents, conducted interviews, and assessed water quality to obtain a full picture of the site. Maps gave us an understanding of the layout of the combined sewer system, as well as helped us identify possible sources of contaminants and the impact on public health and the environment. We also determined the conditions of the sewers and pipes. These maps also helped us determine where possible overflow is entering key parts of the canal. In order to arrange site visits, we had to determine whether the canal was accessible. All of our findings were compared to standards and regulations required by local and federal governments. In order to determine the best methods for alleviating the CSO issue, we obtained case studies, government documents, and information regarding current methods of CSO storage applied in situations similar to the Blackstone Canal. We evaluated case studies that describe effective methods of controlling CSO to aid in the creation of a list of possible solutions, and estimated costs, for the Worcester site. With the information from these case studies, we identified criteria to be used in a rubric. This rubric was used to judge the CSO system currently in place. These criteria will included, but are not limited to, how much overflow is discharged into the canal and the cost effectiveness of the current CSO system. Comparing different scenarios and CSO projects aided in determining potential benefits of completing a similar project within the city. In order to begin our feasibility study, ideal methods of controlling or preventing CSO in similar systems were hypothetically applied to the Blackstone Canal. Our team performed in depth research on similar projects to accurately estimate the costs of creating and maintaining a new sewer system in Worcester. As part of our feasibility plan, we identified social, environmental and economic impacts of CSO mitigation scenarios. Case studies gave us some insight towards possible complications or benefits of the project on the Blackstone Canal and the local community. Previous research on the structure of the pipes assisted in studying the effect of each possible solution on the stability of the sewer system. Maps helped identify important points of intersection between streets, the canal, and sewer lines, indicating which areas would be most affected by large construction projects, including changes in traffic patterns and daily commutes. We considered the effect of the project on nearby water bodies to determine how the water quality will be affected. Suggestions for controlling or preventing the CSO in the Blackstone Canal were offered once a cost analysis was completed and the effects on the community and environment were fully understood. This invaluable information led to the completion of a comprehensive feasibility study.